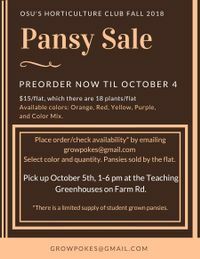 We are currently taking orders for student-grown pansies, which are $15 per flat (18 pansies per flat). Orange, yellow, red, purple and mixed pansies are available. Orders can be placed by sending an email to growpokes@gmail.com with your request by color and number of flats. Pansies will be ready for pickup at the Teaching Greenhouse on Friday, October 5th from 1:00PM to 6:00PM. Note, 100% of proceeds go to support the OSU Horticulture Club, which includes scholarships and club activities.